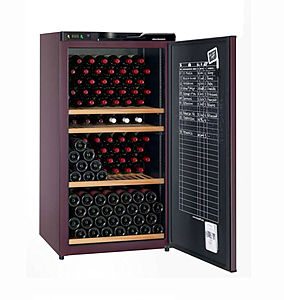 The wine cellar combines the five requirements for proper wine storage: steady temperature, horizontal position, total darkness, clean air and suitable humidity. This is achieved by using both interior and exterior thermometers, a silent, vibration-free refrigeration system, opaque walls and small holes in one side for air circulation. Wine cellars are used to age wine or simply to store it for drinking. They are found in homes, restaurants and professional tasting environments. Wine cellars can be built-in or free-standing. Stainless steel and glass are the most commonly use materials. Small models contain 20 to 60 bottles, while larger versions can hold up to 200 bottles. Choice will depend on intended use (aging, storing, tasting, or a combination) and capacity.